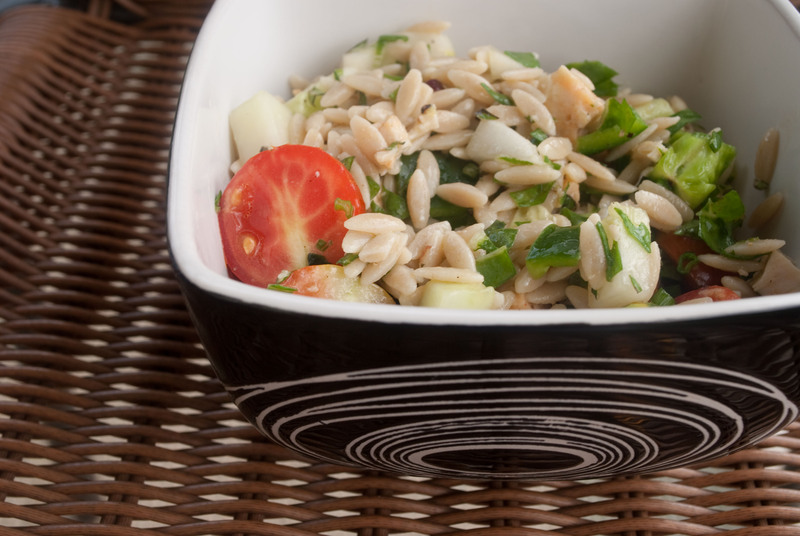 I love orzo salads for many reasons. For one, they are easy to make — just cook the pasta, chop the ingredients, mix, and you are done. They taste good warm, cold, or at room temperature. Also the leftovers keep well for a day or two. This one combines a mix of veggies with whole-wheat orzo and a white wine vinaigrette, and it’s highly customizable so you can cater to the likes/dislikes of your family. Cook orzo in boiling, salted water until tender, 8-10 minutes. Combine all ingredients through basil and stir well. Add salt, pepper, vinegar, and olive oil, and toss until well combined. Fennel, radish, and grapefruit salad — This recipe calls for paper-thin slices of fennel, which you’d usually get with a mandoline. If you don’t have one (like me) just thinly slice by hand or use the slicer blade on your food processor. Grilled romaine lettuce — this is a great side dish with any grilled meat. I know it sounds odd, but try it and I think you’ll love it. Dishes with gnocchi always make me think of college. One of my Italian professors had a party at his house one evening, and he invited all of his students over for a homemade meal. He and his wife served gnocchi, which means “knuckles” — each gnoccho is about the size of a knuckle, so I guess it makes sense. Anyway, it was the first time I’d ever eaten gnocchi, and I fell in love. They are pillowy potato dumplings, often served with a cream sauce. Good gnocchi melt in your mouth. If you like comfort food, this is the dish for you. It’s creamy and indulgent, and everything I want when the weather is cool outside. And since we (hopefully) don’t have many more cool days ahead, I wanted to enjoy it soon. I thought about how to make it for a few days. I knew I wanted gnocchi baked in a creamy sauce with cheese. I had a bunch of chard from my Greenling box, so I added that, because adding greens automatically makes a dish healthy, right? Nutmeg adds a delicious, earthy touch. And for a non-vegetarian version, crispy pancetta gives a bit of smokiness. A homemade toasted breadcrumb topping finishes the dish with a slight crunch. Spinach would be an excellent substitute for the chard. I used fat-free milk, but whole, 1%, or 2% would work just fine. I’ve included both meatless and meaty versions below. The pancetta version varies only slightly in the cooking method. Let me know what you think! Bring a stockpot of water to a boil. Meanwhile, rinse chard really, really well. (I spotted a bug in the water after I washed my bunch. Ew.) Remove tough stems and give chard a rough chop. Add a generous sprinkling of salt to water, and then add chard. Cook for 5 minutes. Drain chard and set aside to cool. Bring another stockpot of water to a boil. Add another generous sprinkling of salt, then add gnocchi. Cook 2-3 minutes, until gnocchi float to the top of the water. Drain. In a large saucepan, heat oil over medium-high heat. Add gnocchi. 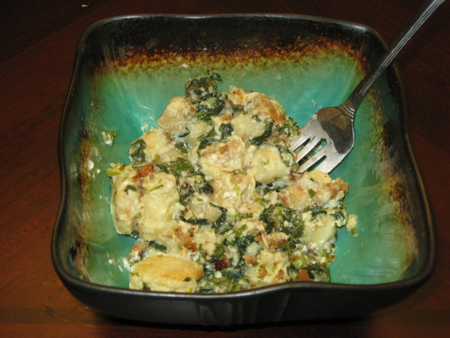 Cook, 12-15 minutes, stirring occasionally, until gnocchi are browned. This step does a couple of things. It adds flavor, but also removes some of the moisture from the gnocchi, keeping them from getting mushy when it bakes. Add gnocchi to a large, greased casserole dish. In the same saucepan, add milk, salt, pepper, nutmeg, cheese, and cooked chard (give it a squeeze to get rid of extra moisture). Bring to a simmer. Whisk flour with a small amount of milk or water and add to milk mixture. Cook over medium-high heat for 5-7 minutes or until mixture thickens, whisking often to keep the sauce smooth. Pour over gnocchi. Melt butter in a small saucepan. Add breadcrumbs and cook for 5 minutes, stirring often, until browned and toasted. Sprinkle over gnocchi. Bake for 20 minutes, until sauce is bubbly. In a large saucepan, heat oil over medium-high heat. Add pancetta. Cook for 5-7 minutes, until pancetta is crisp. Remove with a slotted spoon and place on a few layers of paper towels to drain. Add gnocchi to pan. Cook in pancetta fat, 12-15 minutes, stirring occasionally, until gnocchi are browned. This step does a couple of things. It adds flavor, but also removes some of the moisture from the gnocchi, keeping them from getting mushy when it bakes. Add gnocchi to a large, greased casserole dish. In the same saucepan, add milk, salt, pepper, nutmeg, cheese, pancetta, and cooked chard (give it a squeeze to get rid of extra moisture). Bring to a simmer. Whisk flour with a small amount of milk or water and add to milk mixture. Cook over medium-high heat for 5-7 minutes or until mixture thickens, whisking often to keep the sauce smooth. Pour over gnocchi. 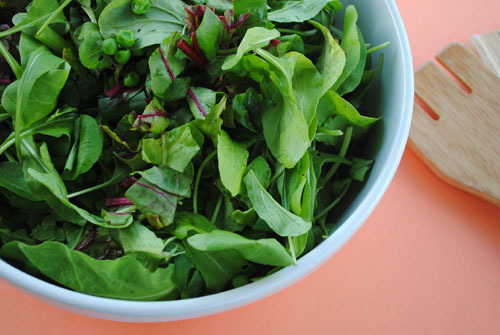 *If you use spinach, you can skip the blanching step. Just give the spinach a rough chop and add it to the milk when you begin your sauce. *I made my own breadcrumbs using a couple of thick slices of stale bread that I ran through the food processor. This produces crumbs that are bigger than the kind you buy in a can at the store. If you use store-bought breadcrumbs, you may want to reduce the amount for this reason. I know I’m a Southern girl, but I have never liked sauteed greens. Collards, turnip greens, mustard greens, yadda yadda yadda — I’ve always found them to be too mushy. But ’tis the season for nice, hearty greens, and while I’ve enjoyed adding them to soups and stews all winter, it does get old. I’ve been staring at a large bunch of chard in my fridge for a few days and decided to attempt my own version of sauteed greens. I also had some beets with their greens still attached, and while I’d never tried beet greens, I’d heard that they cook up much like chard or kale so I thought I’d toss them into the pile. The result? Delicious, even for a long-time sauteed-green hater like myself! The secret is to not cook them too long (I still don’t think I’m ever going to eat plain braised greens) and serve them atop a bed of a hearty whole grain, like quinoa or brown rice, which adds texture. To make this a main meal, I added a link of sliced homemade vegan sausage, but it would still make a tasty side without it. 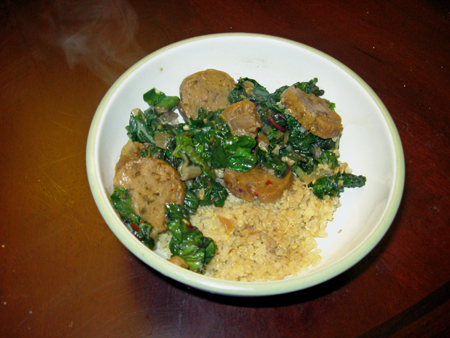 You could also add regular Italian sausage for a non-veggie version. Rinse greens really, really well (they hide a lot of dirt) and remove tough stalks. Chop into bite-sized pieces. Heat oil over medium-high heat in a large skillet. Add onion and cook for five minutes, until almost translucent. Add fennel, red pepper, and garlic, and sautee for 2 minutes, stirring constantly. You want the garlic to just begin to brown. Add greens, salt, and pepper and sautee 2-3 minutes, just until greens begin to soften. Add broth and sausage, stir well, and cook for 5-7 more minutes, until most of the liquid has cooked off and the greens are tender but not mushy.